More of the same won’t do, on the economy or any other issue. We need innovative ideas, bold action and courageous leadership. That’s not just empty rhetoric, and the idea that we have the ability to solve our toughest problems isn’t some pie-in-the-sky dream. In New York, working with leaders from both parties and mayors and governors from across the country, we’ve demonstrated that an independent approach really can produce progress on the most critical issues, including the economy, education, the environment, energy, infrastructure and crime. I believe that an independent approach to these issues is essential to governing our nation — and that an independent can win the presidency. I listened carefully to those who encouraged me to run, but I am not — and will not be — a candidate for president. I have watched this campaign unfold, and I am hopeful that the current campaigns can rise to the challenge by offering truly independent leadership. The most productive role that I can serve is to push them forward, by using the means at my disposal to promote a real and honest debate. In the weeks and months ahead, I will continue to work to steer the national conversation away from partisanship and toward unity; away from ideology and toward common sense; away from sound bites and toward substance. And while I have always said I am not running for president, the race is too important to sit on the sidelines, and so I have changed my mind in one area. If a candidate takes an independent, nonpartisan approach — and embraces practical solutions that challenge party orthodoxy — I’ll join others in helping that candidate win the White House. The changes needed in this country are straightforward enough, but there are always partisan reasons to take an easy way out. There are always special interests that will fight against any challenge to the status quo. And there are always those who will worry more about their next election than the health of our country. These forces that prevent meaningful progress are powerful, and they exist in both parties. I believe that the candidate who recognizes that the party is over — and begins enlisting all of us to clean up the mess — will be the winner this November, and will lead our country to a great and boundless future. I’m not at all surprised. It has appeared for a while that Bloomberg was waiting to see who the nominees from the major political parties would be before deciding whether he would run. Back when there was first speculation about Bloomberg running I wrote that, while chances for a third party victory would be remote under any circumstance, his chances would be best if the election pitted John Edwards against Mike Huckabee. This would provide the greatest opportunity to pick up voters from each party who would be unhappy with the nominee and might be willing to consider a socially liberal and economically moderate candidate. It is clear that the race will not be between Edwards and Huckabee, despite Huckabee remaining in the race. The worst situation for Bloomberg would be an election between Barack Obama and John McCain. It now appears virtually certain that McCain will be the Republican nominee and Obama has become a strong favorite to win the Democratic nomination. This combination will not leave enough voters from either party who would gamble on a third party bid by someone with his viewpoints. Instead any challenges this year will be more likely to come from the extreme left and extreme right, which will not have any chance at victory. Ralph Nader has entered the race but is no longer taken seriously by very many. It is possible that there will be a conservative challenge to McCain, but most conservative Republicans will probably remain loyal to their party. The Libertarian Party and the theocratic Constitution Party will continue to run candidates from the right, but they will have no more impact than Ralph Nader. I discussed this in the live debate blog. But I think it’s worth going back and watching Russert’s run of shame here. I would say it was borderline to bring up the issue of Farrakhan at all. But perhaps since it’s getting some media play you bring it up just for the record, for Obama to address. That’s not what Russert did. He launches into it, gets into a parsing issue over word choices, then tries to find reasons to read into the record some of Farrakhan’s vilest quotes after Obama has just said he denounces all of them. Then he launches into a bizarre series of logical fallacies that had Obama needing to assure Jews that he didn’t believe that Farrakhan “epitomizes greatness”. As a Jew and perhaps more importantly simply as a sentient being I found it disgusting. It was a nationwide, televised, MSM version of one of those noxious Obama smear emails. If anyone had any doubt that Hillary’s campaign is trying to score points against Obama in the Jewish community – today she gave us the proof, publicly. “You asked specifically if he [Obama] would reject it [the endorsement] and there’s a difference between denouncing and rejecting”, she argued. Meaning – Obama is merely denouncing Farrakhan instead of rejecting the endorsement. What was she trying to say – that Obama is somewhat anti-Semitic? Let’s assume she was just thinking that Obama was playing politics and is trying not to offend Farrakhan’s supporters while he denounces his views. In any case, in this exchange Obama got the upper hand: “If the word ‘reject’ Senator Clinton feels is stronger than the word ‘denounce’, then I’m happy to concede the point and I would reject and denounce [Farrakhan]” he said. Obama spoke about this same issue a few days ago as he was meeting a group of Jewish activists in Cleveland. Some who attended the event and do not belong to his camp said he was very convincing. “At his best,” one of them said. But in the debate he was even better and was able to score again on the same topic, elaborating on something of great importance to Jewish liberals. Just recently we were all watching The Jewish Americans series on PBS, in which the story of Jewish involvement in the civil rights movement was front and center – and the part describing how the bond between black Americans and Jewish Americans was breaking was almost puzzling. Obama, talking about Farrakhan – and about anti-Semitism among African-Americans, which he also denounced in his speech on Martin Luther King Day – touched a sensitive nerve when he was talking about one possibility that’s inherent to his candidacy: he has the chance to restore the alliance between blacks and Jews. As leaders of the Jewish community, none of whose organizations will endorse or oppose any candidate for President, we feel compelled to speak out against certain rhetoric and tactics in the current campaign that we find particularly abhorrent. Of particular concern, over the past several weeks, many in our community have received hateful emails that use falsehood and innuendo to mischaracterize Senator Barack Obama’s religious beliefs and who he is as a person. We won’t dignify these falsehoods by repeating them in order to refute them. Instead, we will express our outrage at these tactics, which are being used to demonize a good and decent man and our friend and colleague. Attempting to manipulate voters into supporting or opposing one candidate or another based on despicable and fictitious attacks is disgraceful. These false and malicious attacks should not be part of our political discourse. The manner in which Obama has dispensed with these smears provides a stark contrast to Ron Paul, whose campaign was derailed due to actually soliciting support from extremists, refusing to return a contribution from Don Black, and whose writings echoed some of the same extremist views of those endorsing him. As Josh Marshall has noted, Tim Russert has essentially repeated an email smear on national television. The saddest part of all for Democrats is how Hillary Clinton unsuccessfully tried to use this to her political advantage. In doing so, Clinton lowered herself to the same level as those who are sending out the email smears against Obama. 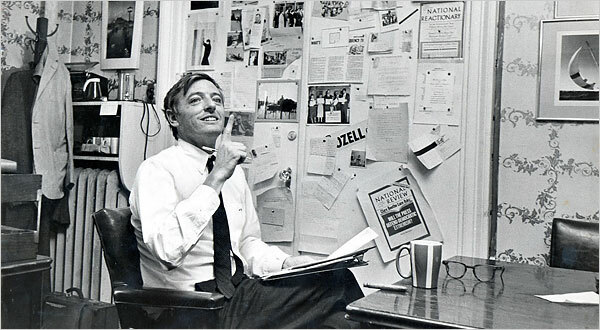 William F. Buckley, Jr has died at age 82. While the news is too recent for much reaction, National Review Online does note that he died while at work in his study, exactly how they think he would have wanted it. Buckley’s great achievement, as noted by The New York Times, was to make conservatism “a system of ideas.” We might not agree with many of his ideas, but Buckley was the type of person to turn to in order to hear opposing viewpoints argued with intelligence and wit. In a day before blogs and twenty-four hour political coverage, The National Review and Firing Line provided intelligent discussion of politics regardless of whether I agreed with Buckley’s viewpoints. Buckley’s works also provided for an education in the English language along with politics. National Review also helped define the conservative movement by isolating cranks from Mr. Buckley’s chosen mainstream. Buckley not only rejected extremists such as the Birchers. In recent years he has rejected the biggest mistake made by the Republican Party writing, “One can’t doubt that the American objective in Iraq has failed.” Buckley’s death will certainly be a tremendous loss to the conservative movement. Hillary Clinton had one last chance to try to change the dynamics of the race before the Ohio and Texas primaries. Instead she showed why her campaign has failed in a mixed performance in Tuesday’s debate (transcript here). Gone are the days in which Clinton both led in the polls and dominated the debates. While Obama sometimes got lost in the group debates, he has learned to take charge of the one on one debates while Clinton often looked desperate. Clinton even resorted to playing the victim card as she complained about being asked questions before Obama, trying to compare the situation to a skit on Saturday Night Live in which the reporters fawned over Obama. Just as in the actual campaign, Clinton often tried to shift the focus to trivialities instead of real issues. The moderators did not help in this matter as they began with some of the nonsense attacks which I’ve already discussed in recent posts. This was followed by a discussion on health care. Clinton argued for mandates based upon a fallacious analogy to Social Security. As Social Security is financed by taxes paid throughout one’s working life it is quite different from health insurance which has premiums billed during the same year of coverage. Obama throughly debunked Clinton’s argument by giving the example of Medicare Part B. Medicare Part B covers physician’s services and is paid out of premiums deducted from the beneficiary’s Social Security payments. Part B is voluntary but, as Obama pointed out, it is very rare for anyone to decline this program because it is such a good deal for them. Of course this is an older population which might better understand the need for health coverage. I’m sure there will be people in their 20’s and 30’s who will think they are healthy and don’t need health coverage. This would not leave us any worse off than we are now, while those who do desire coverage would be far better off under Obama’s health care plan. Much of the credit for SCHIP usually goes to Sen. Ted Kennedy, D-Mass., who shepherded the legislation through a Republican-controlled Congress. But the Clinton campaign says she used her influence behind the scenes to push for SCHIP, and there is evidence to support that. We don’t dispute that Clinton worked behind the scenes for SCHIP, but the TV ad gives her disproportionate credit for the entire program. We find that the ad overstates her role on this count and also on the broader issue of universal health care. And so we find the claim to be Half True. Clinton’s contradictions on NAFTA were presented. Tim Russert thrives on the gottcha question and was well prepared to hit Clinton with all her contradictory statements in which she has alternately been for and against the treaty. Hillary Clinton struck out yet again when questioned as to the validity of her promise to create five million new jobs over ten years. Russert reminded her that she pledged to create 200,000 new jobs in New York when running for the Senate in 2000. He noted that instead there’s been a net loss of 30,000 new jobs. Clinton now says she made the promise based upon the assumption that Al Gore would be president, but no such conditions were given when she made her initial pledge. This only has me wondering what excuses she will devise when she is unable to deliver on her current promises. Obama again beat Clinton on foreign policy. Clinton unsuccessfully tried to downplay the importance of Obama’s opposition to the Iraq war, failing to realize that in any comparison to George Bush it is her and not Obama who comes out as the failure. Once again she tried to create a false equivalence between the all important decision to go to war and more recent votes to fund the war once it was already underway. Clinton also hit Obama with what Josh Marshall described as a “litany from Hillary which is I think at best a series of half truths and distortions.” Obama did a good job of showing that Clinton was distorting his positions. Russert then resorted to a series of hypothetical situations on foreign policy which were not worthy of a debate. It was getting to be so absurd that I half expected him to next ask Clinton a question such as, “What would you do if Cylons attacked Earth?” Russert was probably the guy in a college dorm who tried to get lots of late night discussions going but wound up getting a swirlie. Clinton got hit yet again regarding her unwillingness to release her income tax returns and her papers as First Lady. She brought up all the same bogus excuses such as those I discussed in this post as she tried to make it appear that the papers are being kept secret for reasons beyond her control. While Obama quickly dispensed with the Farrakhan issue, Hillary Clinton has been hindered by her vote for the Iraq war since 2002. She finally took a step further than in the past when she cited this vote as one vote she would take back. In the end, Clinton had a number of missteps. She raised numerous insignificant arguments but, as with the rest of her campaign, failed to provide a good reason to support her.